1040-8M-30 HTD Belt, Synchronous Belt 1040-8M-30, HTD 1040-8M x 30mm Wide. Home > Synchronous Belts > One Sided Timing Belts (Single Side Synchronous Belts) > HTD Timing Belts. Round (Curvilinear) Tooth Profile > 1040-8M-30 HTD Synchronous Timing belt. 30MM Wide. 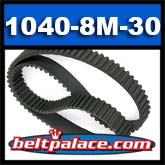 1040-8M-30 HTD Synchronous Timing Belt. SPEC: 8Mm Pitch X 1040mm Length OC X 30mm Width. 130 Teeth. Replacement “HTD/H” Series industry standard Synchronous Belt. Popular replacement belt for fitness equipment and power tools such as CNC Machines, woodworking tools & lathes, pumps, and robotic equipment. Synchronous Belt 1040-8M-30 - (Metric Standard). BANDO (Contitech) 1040-8M x 30mm W Synchronous belt. 1040-8M-15 Bando Industrial Synchronous Timing Belt. SPEC: 8Mm Pitch X 1040mm Length OC X 15mm Width. 130 Teeth. Replacement “HTD/H” Series industry standard Synchronous Belt. Popular replacement belt for fitness equipment and power tools such as CNC Machines, woodworking tools & lathes, pumps, and fitness equipment. Synchronous Belt 1040-8M-15 - (Metric Standard). BANDO (Contitech) 1040-8M x 15mm W Synchronous belt. Fitness Drive belt 1040-8M, 9/16" wide. 1040-8M-36 BANDO Synchronous belt. INDUSTRIAL GRADE. 1040mm L x 8mm Pitch x 36mm W.
Timing belt 1040mm length, 36mm wide, 130 Teeth. Drive belt for Yardsport YS36 XLT Electric Side by Side.